DAY 1: Welcome to the 6th Annual Twelve Days of Christmas Cookies! 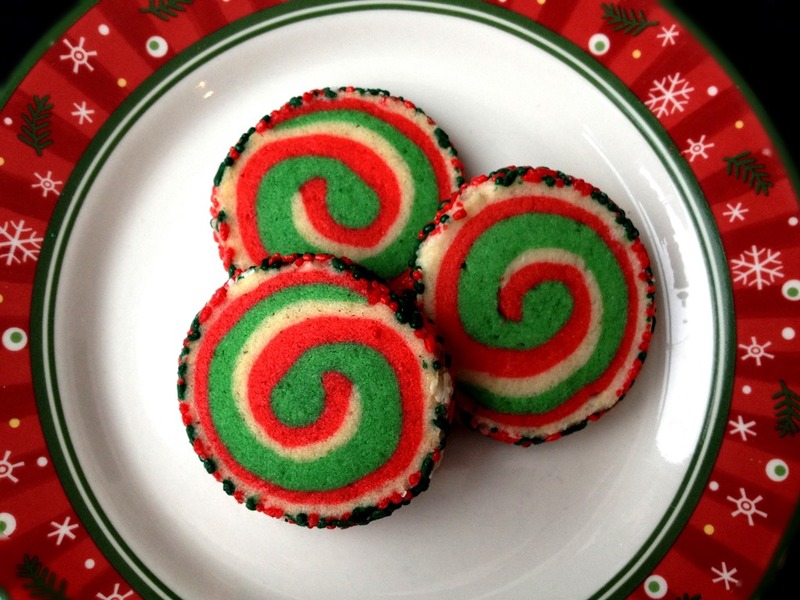 First up is a fun Christmas Pinwheel Cookie. 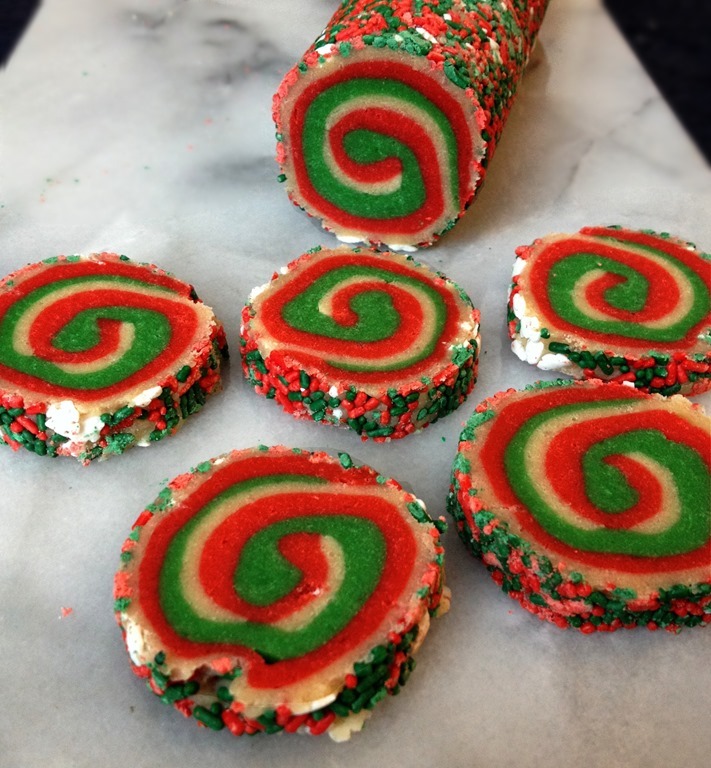 This is a fun way to use a simple sugar cookie dough to make multi-colored swirled cookies. Roll dough rectangles together to form a log and then slice and bake. This dough is great for making ahead and freezing, then baking later. The recipe comes from Just a Taste, who made them in red, white and blue for the 4th of July. Using a mixer, beat the butter and sugar until light and fluffy. Mix in the eggs and the vanilla and almond extracts. Add the flour mixture and beat just until combined. Remove the dough and separate it into three equal pieces (use a kitchen scale to weigh dough, if possible). Leave one section white. Beat (or knead with hands) red food coloring into one section and green food coloring into the third section. Wrap each section in plastic wrap and refrigerate for one hour. Remove the dough from the refrigerator and divide each color in half (you will be forming 2 dough logs). Place one of the sections of dough on a piece of waxed paper. Pat into a rough rectangle. Place a piece of plastic wrap over dough and use your fingers or a rolling pin to form a rectangle about 9” x 6” and about 1/8” thick. Repeat with remaining dough sections. Stack the dough into two rectangles (remove plastic wrap and waxed paper): red, then white, then green. Use a rolling pin to lightly press the dough rectangles together. Starting at the longer edge of the rectangle, roll the dough into a tight log. Place the Christmas sprinkles on a large platter or rimmed baking sheet and roll the dough logs in the sprinkles, lightly pressing them into the sides of the dough. Wrap the 2 dough logs in plastic wrap and refrigerate for at least one hour before baking. To bake: Preheat oven to 350°F. Line baking sheets with parchment paper or a silicone mat. Remove dough from refrigerator. Use a sharp knife to slice logs into 1/4” rounds. Place 2 inches apart on baking sheet. Bake for 9-11 minutes. Cool on a wire rack. NOTE: Dough logs can also be frozen. Thaw in fridge overnight before cutting and baking.